It is incredible how our moose population has exploded. 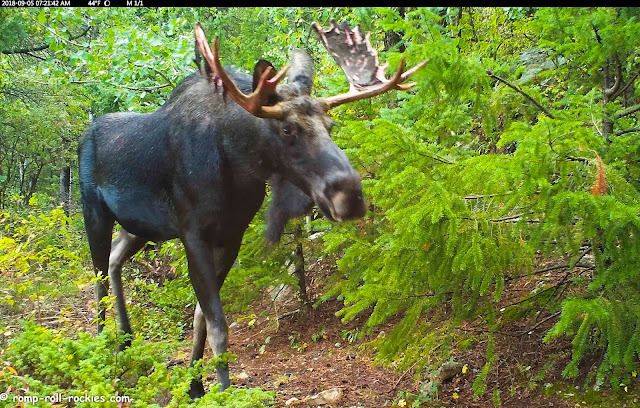 Prior to 2010, I'd never captured a trail cam photo of a moose. Now, they are the most numerous species that my cams record. Here is a big bull moose in the midst of losing his antler velvet. In early September, I was heading for a trail camera that I have set up to capture video of bears digging up an ant hill. As I walked toward the cam, a bull moose trotted away from the cam. He stopped a short distance away to watch me. His antlers were losing their velvet... and he looked huge. 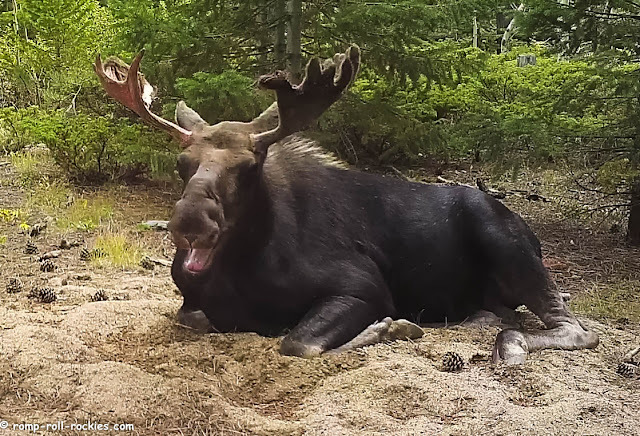 When I checked the cam, I discovered that the bull moose had been lying on the ant hill for several days in a row. That truly puzzled me because I go crazy with ants crawling up my legs when I check that cam. The cam is about 15' from the ant hill. Why, oh why would a moose want to lie on the ant hill? My best guess is that the sand is cool, and his fur is thick so the ants don't bother him. 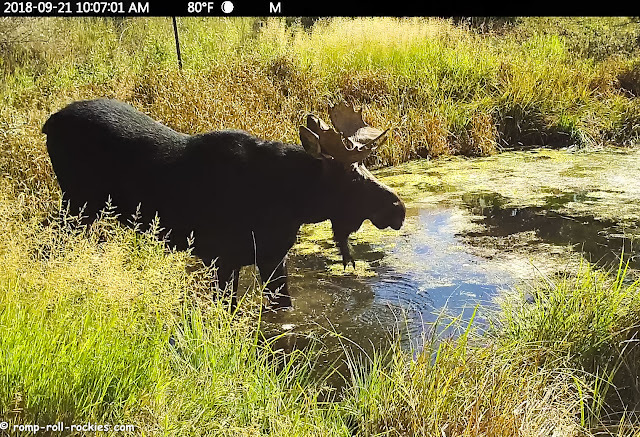 The first clip in today's video is of the bull moose on the ant hill. Here is an instant in mid-yawn. The rest of the video is showing interesting snippets of behavior of moose during mating season. It has rained only once this month, and it was a humdinger of a thunderstorm. A bull moose chose to chase a cow moose through the forest during that scary storm - and they both seemed oblivious to the flashes and booms. That is the second clip in the video. 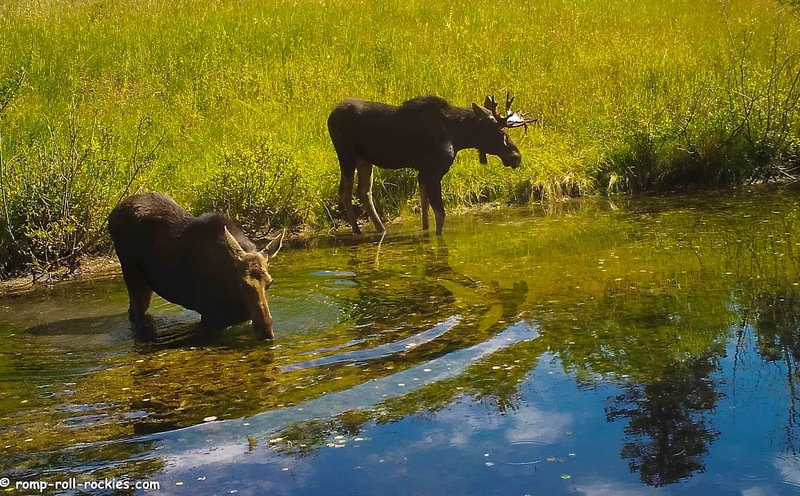 During mating season, the moose seem to love a pond on my friends' land. One bull hung around there by himself one day and evening. He decided to attack a tree right next to my camera. It rattled the camera in a huge way but, thankfully, didn't damage it. It was amazing to "feel" the force of the moose's antlers via the camera recording. At that same pond, moose couples showed up a number of times. I found it so intriguing to listen to them vocalize as they foraged by the pond together. They sound almost eerie as they "converse". I hope that you enjoy the short video. He sure is a nice looking great big dude! you have given me the gift of watching wildlife from home. these big guys never cease to amaze me. he is so ugly he is beautiful... sounds just like a male and female old married couple, or it does around here sound like this. owie on that ant hill. Moose love the sand. In Wyoming there are sandy spots along the river, and they will head right for them. My theory, yes its soft and cool like you said. But the boys can also dig their pee pots easier in the sand. All part of the mating ritual. We think the soft sand feels comfortable for them. 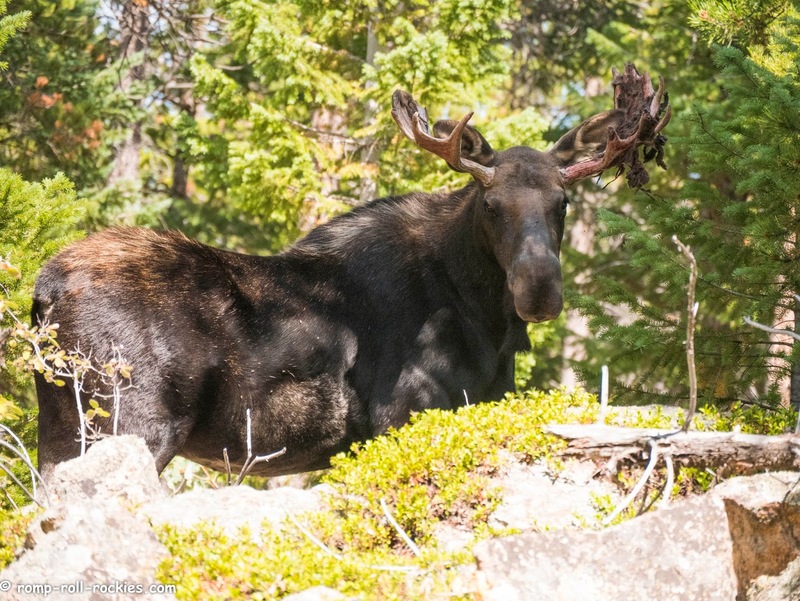 We never saw a moose up close before, but by the photos you shared they are such beautiful animals. Maybe the ants don't bother them like they do to us. This was very interesting and we are going to read up more about it. Thanks for the share. Have a wonderful day. Love that yawn! Great photos and video, KB! The moose seem to love my yard during the fall rut! We didn't see moose all summer but now we must watch carefully for them. I have heard this vocalizing between male and female - it does sound eerie. A few days ago two bulls were in pursuit of a cow - the younger-looking bull was kicking to the side as he ran. I assume they were in for a fight, but luckily it didn't happen in my back yard! Great videos, KB! My Aunt and Uncle, and my cousin and Godchildren, live in Alaska. They have seen moose on a pretty regular basis, including the ones chasing them across their yard! I think that is one animal I'm glad we don't have in my area. Fascinating. I have never observed moose before. They are cool and funny. They are such large magnificent creatures. Their strength is amazing! Could it be the same reason Crows lay on ant hills? Ants have an acid bite that clears out the mites. Wow KB! Your videos capture the most amazing nature scenes!